Have you ever seen undesired pop-up ads or notifications from Wp.ournewstoday.com? This problem can happen if an adware (also known as ‘ad-supported’ software) took control of your computer or browser. In most cases, the ad-supported software installs on the machine in a bundle with freeware that you downloaded and installed from the Net. Once it gets inside your system, it’ll modify certain PC system’s settings in order to reroute your web browser to undesired sites or show lots of unwanted pop up ads from various third-party ad networks. We suggest you to clean you computer from adware and thus remove Wp.ournewstoday.com pop up ads. You need to follow the steps below immediately. It will remove all unwanted pop up advertisements and protect your computer from more harmful software and trojans. In the steps below, we’ll try to cover the Google Chrome, Microsoft Internet Explorer, Firefox and Edge and provide general advice to remove Wp.ournewstoday.com pop-up advertisements. You may find some minor differences in your Microsoft Windows install. No matter, you should be okay if you follow the steps outlined below: delete all suspicious and unknown software, reset web-browsers settings, fix web-browsers shortcuts, remove harmful scheduled tasks, run free malware removal tools. Certain of the steps will require you to reboot your personal computer or exit this website. So, read this instructions carefully, then bookmark or print it for later reference. The useful removal tutorial for the Wp.ournewstoday.com redirect. The detailed procedure can be followed by anyone as it really does take you step-by-step. If you follow this process to remove Wp.ournewstoday.com redirect let us know how you managed by sending us your comments please. First, go to Microsoft Windows Control Panel and remove questionable programs, all applications you don’t remember installing. It’s important to pay the most attention to software you installed just before Wp.ournewstoday.com popups appeared on your web browser. If you do not know what a program does, look for the answer on the Net. Scroll through the all list, and remove dubious and unknown software. To quickly find the latest installed software, we recommend sort programs by date. Run the Reset web-browser utility of the Chrome to reset all its settings such as new tab, startpage and default search provider to original defaults. This is a very useful utility to use, in the case of internet browser redirects to annoying ad web-pages such as Wp.ournewstoday.com. Once this procedure is complete, your internet browser’s home page, new tab and default search engine will be restored to their original defaults. Resetting your Firefox is basic troubleshooting step for any issues with your internet browser application, including the redirect to Wp.ournewstoday.com website. It will keep your personal information such as browsing history, bookmarks, passwords and web form auto-fill data. If you find that Internet Explorer web browser settings such as newtab page, default search provider and homepage had been replaced by ad-supported software responsible for redirections to Wp.ournewstoday.com, then you may return your settings, via the reset browser procedure. In the “Internet Options” window click on the Advanced tab, then press the Reset button. 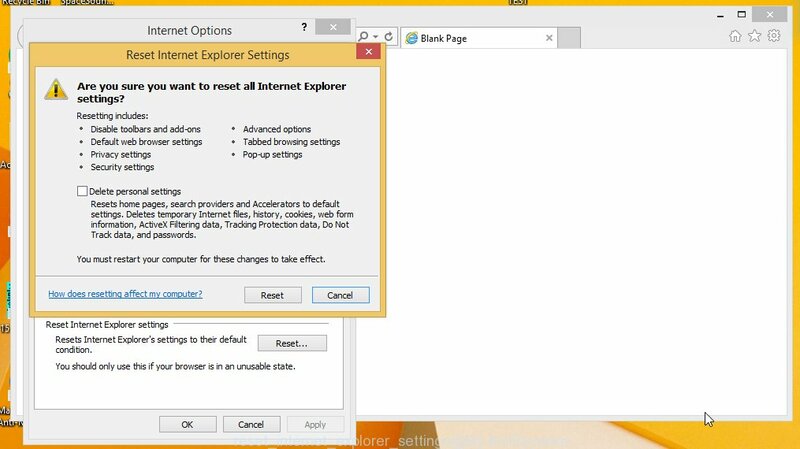 The Microsoft Internet Explorer will show the “Reset Internet Explorer settings” window as displayed on the screen below. Select the “Delete personal settings” check box, then press “Reset” button. 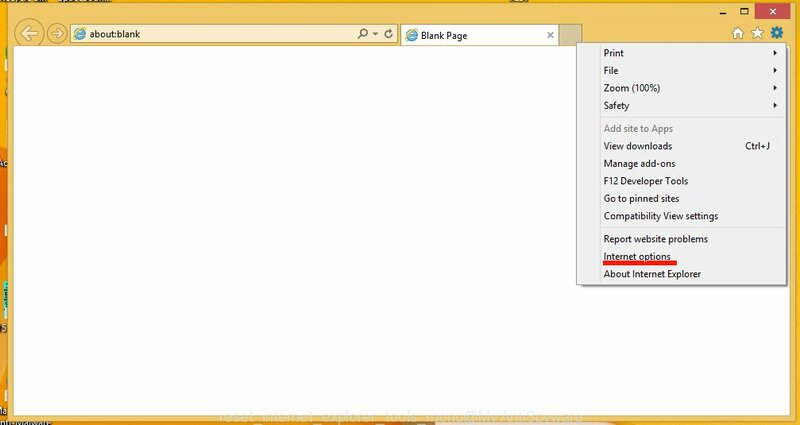 In order to completely delete Wp.ournewstoday.com, you not only need to delete ad supported software from your computer, but also remove all its components in your PC system including Windows registry entries. We suggest to download and run free removal utilities to automatically free your personal computer of adware related to Wp.ournewstoday.com redirect. 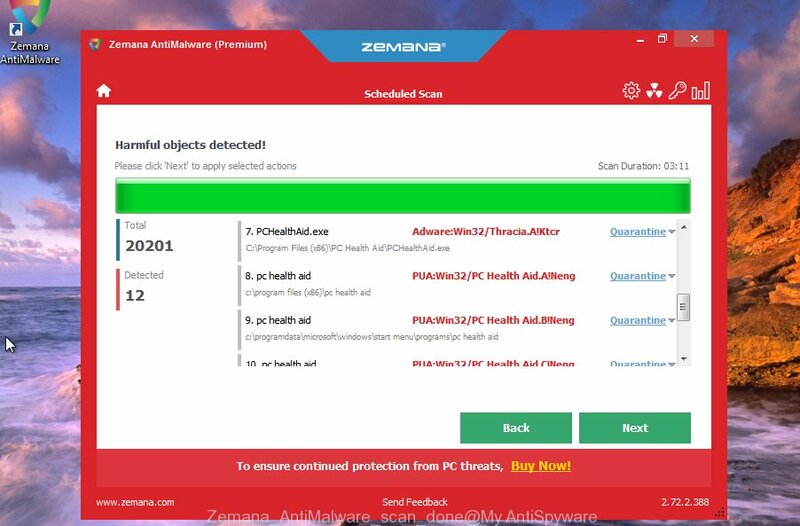 Zemana Anti Malware (ZAM) is a free program for Windows operating system to search for and delete PUPs, adware, malicious web browser addons, browser toolbars, and other unwanted applications like adware which cause annoying Wp.ournewstoday.com popups to appear. Please go to the following link to download Zemana Anti Malware (ZAM). Save it to your Desktop. After downloading is complete, run it and follow the prompts. 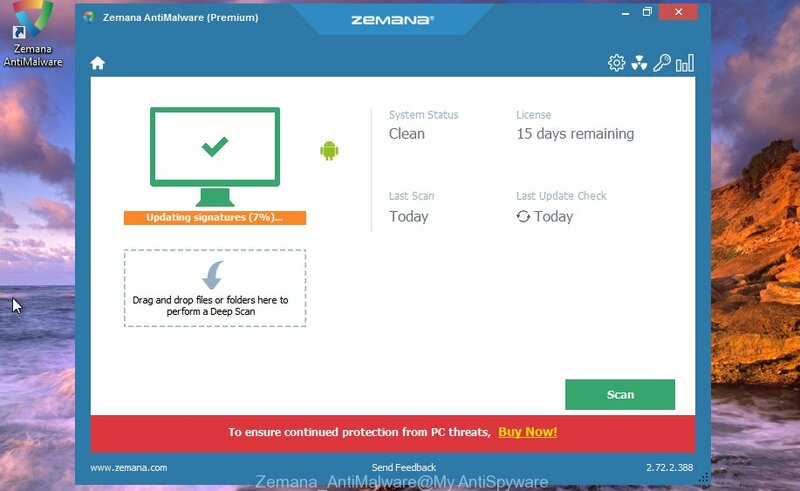 Once installed, the Zemana will try to update itself and when this procedure is finished, click the “Scan” button for checking your PC system for the adware which causes unwanted Wp.ournewstoday.com advertisements. Depending on your computer, the scan may take anywhere from a few minutes to close to an hour. When a malicious software, ad supported software or potentially unwanted apps are found, the number of the security threats will change accordingly. Wait until the the scanning is finished. Review the results once the tool has finished the system scan. If you think an entry should not be quarantined, then uncheck it. Otherwise, simply click “Next” button. The Zemana will remove ad-supported software responsible for Wp.ournewstoday.com redirect and add threats to the Quarantine. If you browse the Internet, you cannot avoid malicious advertising. But you can protect your web-browser against it. Download and use an ad-blocking program. AdGuard is an ad-blocking which can filter out a ton of of the malvertising, stoping dynamic scripts from loading malicious content. After the install is finished, click “Skip” to close the installation application and use the default settings, or press “Get Started” to see an quick tutorial that will assist you get to know AdGuard better. In most cases, the default settings are enough and you do not need to change anything. Each time, when you start your personal computer, AdGuard will start automatically and stop pop-up ads, Wp.ournewstoday.com pop-ups, as well as other malicious or misleading web-pages. For an overview of all the features of the application, or to change its settings you can simply double-click on the icon named AdGuard, which is located on your desktop. Now your computer should be clean of the ad-supported software that created to redirect your browser to various ad web sites like Wp.ournewstoday.com. We suggest that you keep AdGuard (to help you block unwanted pop-up ads and unwanted malicious web-pages) and Zemana Free (to periodically scan your computer for new adwares and other malicious software). Probably you are running an older version of Java or Adobe Flash Player. This can be a security risk, so download and install the latest version right now. If you are still having problems while trying to remove Wp.ournewstoday.com ads from the Edge, Mozilla Firefox, Internet Explorer and Chrome, then ask for help here here.